On Saturday one of our friend have a garage sale in their community. This is very typical here especially during summer. People are purging out excess stuff and better time to do it is summer. There are also lots of garage sale hunters here and as the saying goes other people's trash is another person's treasure. 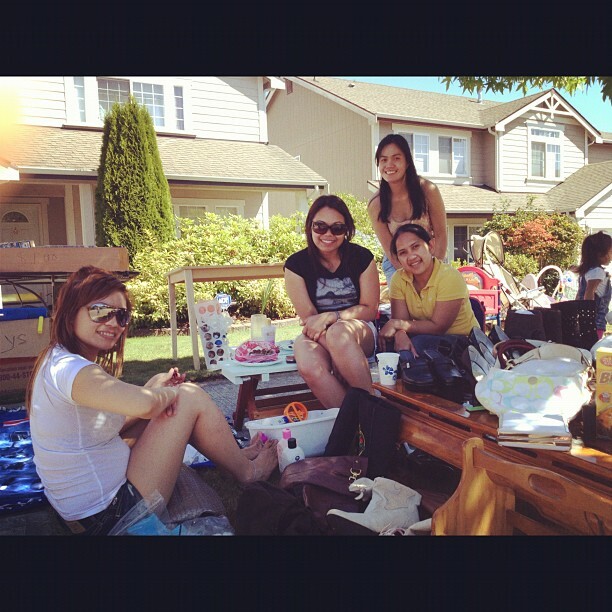 I love going to garage sale along with my friends here. It's fun and you can have great finds as well too. I brought some of our baby stuff and toys that we don't use anymore to my friend's place to sell. I got there after lunch because I did some house chores first and had the kids ready too. It was not only a garage sale but also our friend's birthday. Some friends who have stuff to sell came too and we got a lot of fun. Some friends were dancing and some on the side doing manicure and pedicure. We pigged out Filipino foods and even though we did not sell a lot but it was a lot of fun. The garage sale resumed Sunday, and in fairness most of the stuff I brought in were sold. This coming weekend another friend's community will be doing a garage sale and on the 18th our community will be hosting a community garage sale as well. I am planning to participate and sell on that day. I have to sort out stuff that we don't need and those that will not be sold will be brought to Goodwill and send to my family. hahah i love garage sales! we went to a few last saturday but i didn't find what I want to have but it was fun! weeee! maka-experience na jud ko og garage sale soon! hehehe. super late 216 BPC visit here. that is fun thing to do Momi Bless :-) we never have a garage sale in our house or my friends house :-) Dropping from BPC.